Here's a monkey king of a different kind from Adam Koford, who does sketches of hobos. This one is called "Monkey King Harold", and I'm quite fond of the look. 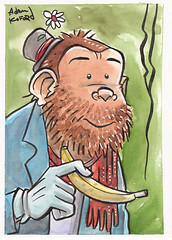 Should probably make an icon out of it... but I think I may like Uncle Monkey even better. I don't know, the one with the crown and cigar is pretty awesome. Of course, you could just make icons out of them both. Two for one! I just need captions. I was just listening to an album of old hobo songs. Appropriate timing on the link! Ok, I gotta ask: What's the name of the album, and where do I get one? By giving $40 to Amazon! Utah Phillips is a former hobo and Korean war vet who is the son of labor organizers; he's a storyteller and a walking library of labor/organizer songs and tramps music. "Starlight on the Rails" is a four disc collection of the work he hopes will outlive him. Best of all, every song has an introduction where he tells the story of how it came about. As an acquired taste, you may want to track down some of his other music first and seeing if you like it; just avoid the (to me) disappointing album "the past didn't go anywhere", which he did with Ani DiFranco. And if you ever have the chance to see him live, grab it with both hands. He's superb. my nieces know me as Uncle Monkey. Uncle Monkey looks disturbingly like my grandpa when he's in his hobo clown outfit. Clearly, I need to buy him a banana joint.